Clach's Colin MacRae, who recently underwent an operation to donate bone marrow. MacRae came off the bench against Fraserburgh last weekend less than a month after going down to a private hospital in London, which specialises in bone marrow transplants. 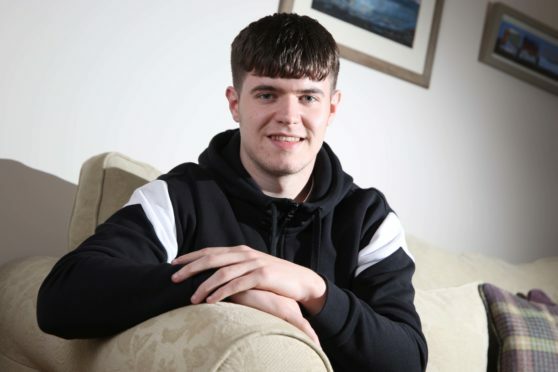 The 21-year-old midfielder from Helmsdale signed up to the Anthony Nolan charity with some of his college class-mates three years ago, to support a leukaemia sufferer in her mid-20’s near Brora – one of his friends’ cousins – who at the time was seeking a bone marrow transplant. He said: “When the opportunity came up I really couldn’t say no. I felt like I had to do it and to be honest, I was pretty excited about it all. “Thankfully, it all went well. The operation to take the bone marrow from my hip lasted for just over an hour but I was in the hospital in London for three days altogether. “The original date set was due to tie in with my 21st birthday on February 7, but it had to be delayed a couple of weeks as the young girl, the recipient of my bone marrow, had fallen ill again, but it was good that it eventually went ahead. “Hopefully it will all work out well for the wee lass but we’ll not be told who she is until two years after making the donation. “I was a bit sore after the operation. The area around the hip was pretty tender and any movement was a bit sore.